Shares of SYMC gapped up 3% on the opening, traded up nearly 8%, but has since given come in a bit and is now up 3%. 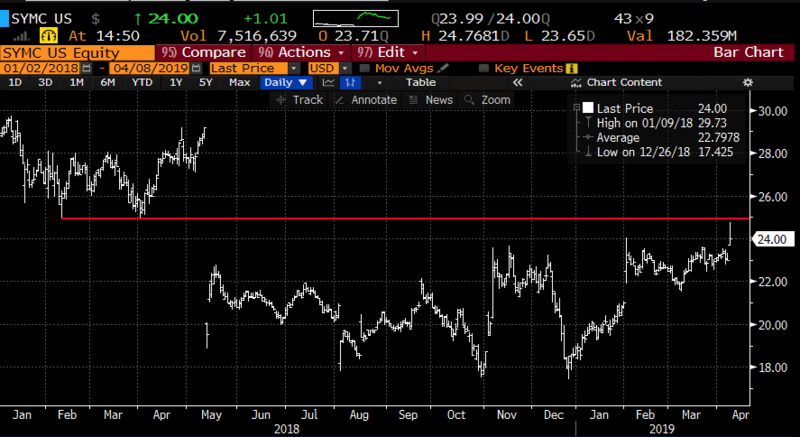 What’s interesting to me about this upgrade is that of the 28 analysts who cover the stock, Goldman is the only bank to now rate the shares a BUY…. there are 24 Holds and 3 Sells. This is very unusual. It appears that an internal investigation of the company’s accounting practices in May caused many analysts to move to the sidelines. Since the conclusion of the investigation in September, with the company not having to restate any earnings, there have been no analysts (until today) to stick their neck out on this one, despite activist investor Starboard taking an almost 6% stake in the company and gaining 3 board seats over the summer. Shares of SYMC traded at about 13.4x expected fiscal 2020 eps growth of 12% on expected sales growth of 5%. If these estimates prove to be conservative, it might prove out to prescient of Starboard if they are pressing for a private equity takeover of the company, as was rumored back in November. There was a large bullish roll in the name that caught my eye this morning at 11am when the stock was trading $24.50, a trader sold to close 12,500 of the July 25 calls at $1.53 (or $1.9 million in premium) and Bought to open 18,750 of the July 27 calls for 80 cents (or $1.5 million in premium). 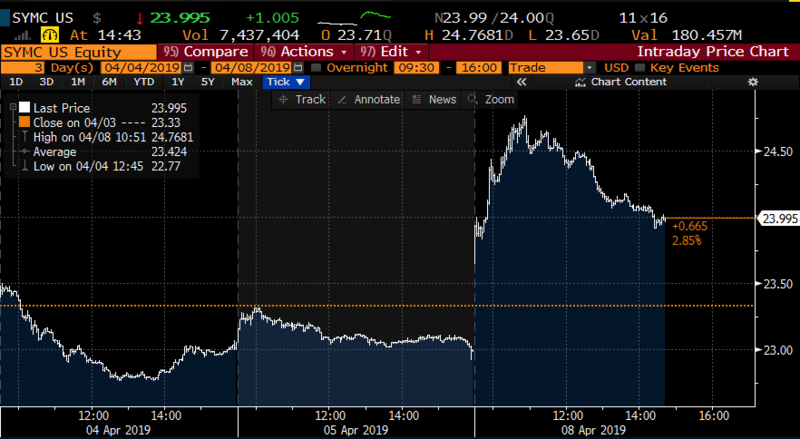 This new trade breaks even at $27.80, up nearly 14% from the trading level and possibly shows increased confidence of one trader that the stock will fill in the gap from the accounting investigation headline last May. The next identifiable catalyst for the stock will be their fiscal Q4 earnings expected before May expiration. The options market is implying about a $2.50 move between now and May expiration, or about 10% in either direction (the May 24 straddle, the call premium + the put premium is offered at $2.50), if you bought that now, and thus the implied movement in the stock at the moment, you would need a rally above $26.50 or a decline below $21.50 to make money by May expiration. Rationale: this trade risks 4% of the stock price if the stock is up 16% on May expiration. The options market is saying there is about a 40% chance this trade is break-even on May expiration and only about a 15% chance that the trade is at its full value.